College DownTime: Nostalgia? Play Number Munchers Now! 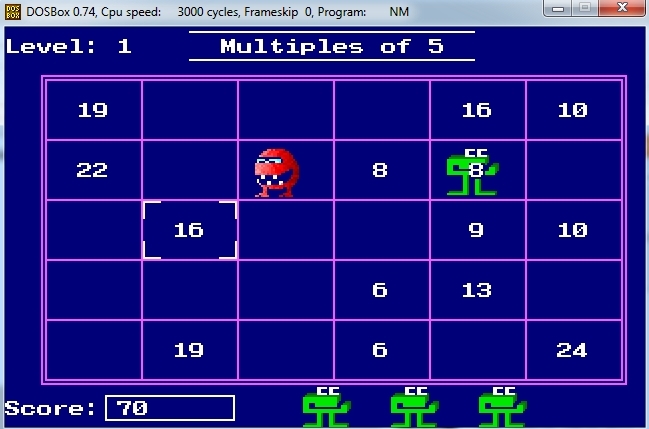 Similar to the article we made on installing and playing Oregon Trail, you can now introduce your family to the nostalgic floppy-disk game Number Munchers! The only computer game your first grade teacher let you play. Play different modes of math problems, like fractions, multiples, addition, etc. All you have to do to win is press space bar and "eat" the numbers, whilst avoiding the evil Troggles. They kill you like no tomorrow and give you more numbers to eat before passing the level. Damn Troggles. Since this is abandonware, you can download it anywhere, anytime. 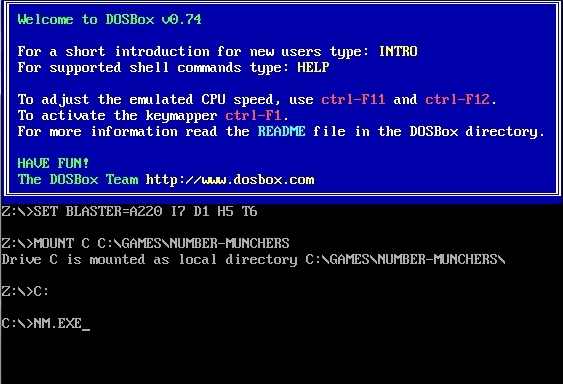 It ran on MSDOS back in the day, so you need DOSBox once again. 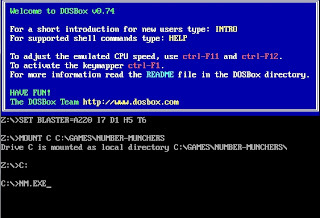 Install the Number Munchers folder to your games folder and let's get ready to load it up. That's it brah. Start playing and enjoy. Just remember to set your directory appropriately and lookup the file name of the application itself, though I am fairly sure it's "nm.exe" for most downloads. FYI - it's not actually a bad game to freshen up for the GREs, as standardized testing standards are lower than ever! This entry was posted on October 4, 2009 at 12:14 pm, and is filed under computer, emulator, freeware, games . Follow any responses to this post through RSS. You can leave a response, or trackback from your own site. Never played that game before so i wasnt that nostalgic, but what a beautiful surprise to see an Oregon trail link :D thanks for sharing!!! Might download when I get on my computer. OOOOOOH, my nostalgia glasses are snug and comfortable!!!! Thanks for the memories, CDT! This sue to be the reward for good behavior in my grade school. I love this game. so i came to “return the favor”.I'm attempting to find things to improve my site!I suppose its ok to use a few of your ideas!! looking to exchange techniques with other folks, please shoot me an email if interested. I'm really loving the theme/design of your web site. Do you ever run into any web browser compatibility problems? A few of my blog readers have complained about my blog not working correctly in Explorer but looks great in Opera. Do you have any solutions to help fix this issue? Hi there everyone, it's my first pay a visit at this website, and post is truly fruitful in support of me, keep up posting such articles or reviews. Very helpful info particularly the last phase :) I handle such information much. Usually I don't read article on blogs, but I would like to say that this write-up very compelled me to try and do it! Your writing taste has been surprised me. Thanks, very great article.